The new core Thunderstrike cards make their appearance. Summary images from Episode 41. Tournament winners and 2 random participants get a foil clear text version of “Demonic Dragon Berserker, Chatura”. ACT (RC): [Rest this Unit] Your opponent chooses 1 card from their Drop Zone, and binds it face-up. If no card gets Bound, Counter Charge 1 card & choose 1 Unit with the Thunderstrike ability, it gains Power+3000 this turn. ACT (RC) Thunderstrike 4: [CB1 & Place this Unit into the Soul] Choose 1 of your Units, during that turn, it gains Power+3000, then your opponent chooses 1 of their Rear-guards, Retires it, and Binds it face-up. AUTO (VC) Thunderstrike 4: When your Ride Phase begins, Counter Charge 1 or Soul Charge 1, your oppponent chooses 1 card from their Drop Zone, and binds it face-up. AUTO (VC): [CB1] When you Stride this card with a G Unit, you can pay the cost. If you do, your opponent chooses 1 card from their Drop Zone, and Binds it face-up. And if Stride with a G Unit with the Thunderstrike ability, your opponent chooses 1 of their Rear-guards, Retires it, and binds it face-up. ACT (VC) 1/Turn: [SB1 & Choose 1 card from your G Zone with the same name as this card, and flip it face-up] Your opponent chooses 1 card from their Drop Zone and Rear-guard respectively, and Binds them face-up. If you have more Rear-guards than your opponent, choose up to 3 of your Units, during that turn, they gain Power+3000. 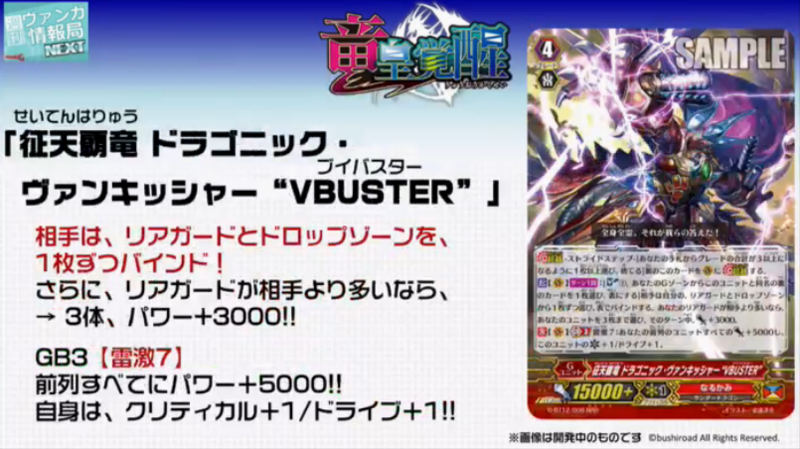 CONT (VC) GB3 Thunderstrike 7: All of your front row Units gain Power+5000, and this Unit gains Critical+1/Drive+1.